Earlier this month I had the pleasure of spending the weekend in Baltimore with my husband. We were child free, flying, and only had 2.5 days to ourselves so I wanted to make it epic by looking my best for my baby. While in Baltimore we’d be attending a wedding so I had to not only pack enough in my carry-on bag to wear for 2.5 days, but I also had to pack wedding attire. To keep the weight under the carry-on bag limit of 50 lbs. 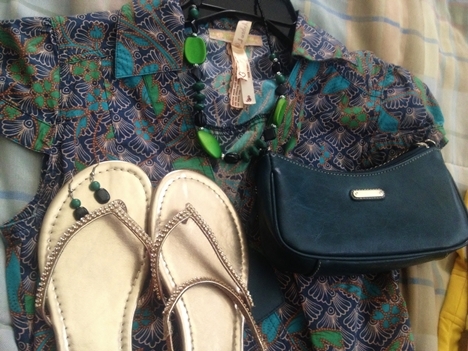 light weight sandals, summer dresses, various tops and 1 pair of jeans. To utilize all of the space available, I store my jewelry and makeup inside of my purses. That way they’d stay organized and be easy to find while on vacation. By wearing light weight sandals I was able to save on the space it would have taken to travel with a larger sandal like the wedge heeled sandal. I did the same with my wedding shoe selection. Instead of wearing a pump, I wore a streamlined styled shoe. As I mentioned already, I only packed one pair of Gap jeans similar to the Legging Skimmer. I wore these twice while in Balitomore by changing out the shirt on each occasion. The first time I wore them was with a black tank and sparkly shrug I bought at the Goodwill. The second time I wore it, I paired it an Ann Taylor Loft pleated top I bought earlier this Summer for $5 and some Forever 21 accessories. I went with a non traditional Summer wedding style and wore a black dress and lightweight black shoes. For our final night in Baltimore I followed my summer style tips and went — Bold, Bright and Blinged with this outfit. This yellow floral dress gives a perfect pop of color and the cold toned and rhinestones sandals and jewelry give the look that extra added sparkle. On top of looking amazing I felt amazing. It was great to get away, date my husband all over again and play dress up for the weekend. What bold bright colors have you added to your wardrobe, jewelry or nail polish collection this year?